The Japanese business cycle is still alive. But a prudent analyst might consider checking its pulse fairly frequently. The economy lacks upward momentum, and it now has to absorb the sales tax increase. This article at Across The Curve offers a quick summary of the latest run of weak Japanese data. The Tankan showed some improvement, but the details were more pessimistic. Industrial output and consumer spending fell in February. The CPI has been drifting upwards. 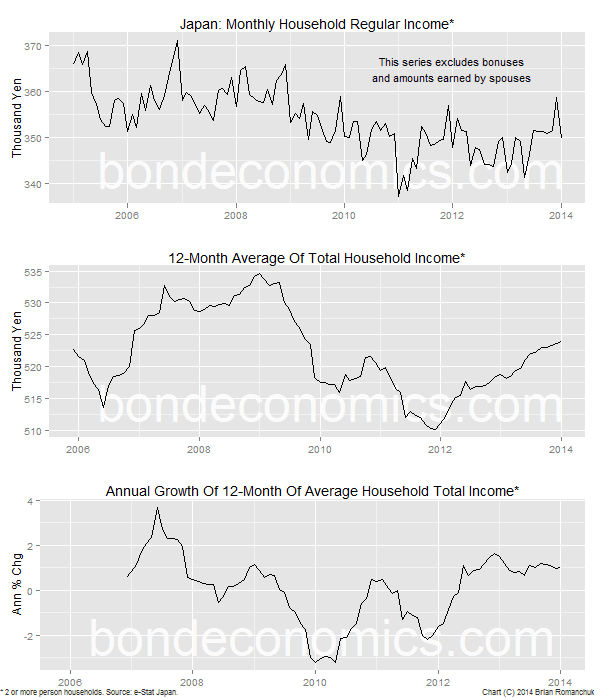 Given soft wage growth, rising consumer prices are just eating into disposable income, dropping sales volumes. Geopolitics poses risks for energy prices, which is a large unknown for the economy. But with the yen stuck in trench warfare between the 100-105 levels, currency weakness will stop being a factor for non-energy import prices. The other news on the CPI front is that the sales tax rise will create a one-time price level shock in the Consumer Price Index. But the only people who will worry about the inflationary effects of that shock are the JGB perma-bears. Finally, the Abe administration has seized upon the idea of front-loading spending this fiscal year (which started April 1st, which is already yesterday for my readers on the other side of the International Date Line). The objective is to create an upward bump to spending over the next few months, and which is supposed to cancel out the effect of the sales tax increase. This frankly smacks of desperation; I cannot remember any recent attempt to micro-manage GDP growth on a quarterly basis by using fiscal policy. Maybe some policy makers attempted to do so in the heyday of stop-go fiscal policies, but they stopped using stop-go policies for good reason. Anyone in the private sector who deals with the Japanese government knows that any surge of spending is going to painfully reverse in a few months, and so they unlikely to change their behaviour to any extent. The only explanation I can think of for this somewhat unusual policy is that the authorities want an upward spike in GDP to coincide with the hike of the sales tax, so that they will be able to pretend that any recession that hits in the near-run was not policy-induced. "I cannot remember any recent attempt to micro-manage GDP growth on a quarterly basis by using fiscal policy. Maybe some policy makers attempted to do so in the heyday of stop-go fiscal policies, but they stopped using stop-go policies for good reason." The difference between now and then is that the government's commitment to pursue countercyclical policy played an important part in inducing stabilizing private sector behavior. In other words, the public's confidence that the government was committed to countercyclical fiscal and monetary policy in itself helped the economy. This very Keynesian view is ironically consistent with rational agents. People forget that credibility, commitment, expectations could actually apply to the fiscal authority as well. Thanks. I am taking a look at the paper. may be worse than a small government sector. This was one observation I had about Minsky's argument that a larger government will stabilise the economy. The large government (>20% of GDP was his threshold) would help prevent depressions. But I did not see huge differences in cyclical behaviour between governments that were at 30% of GDP vs. 40% of GDP. My guess is that government policy changes would make up for the smaller private sector volatility. But it would take a closer study of the data to validate that.